Shopping for materials, fixtures and products to remodel a house. Where to buy materials, fixtures and products for home remodeling projects? Contractors normally buy building materials from local stores. Most supplies available in stock and you do not have to order and wait for delivery. Many retailors offer discounts if the purchases exceed certain amount and even some attractive finance options available. The main advantage to shop local is you can see what you are paying for. Fixture as well as many finishing products might be bought online and delivered to your home. It is very convenient way of shopping and many online stores might not even charge for shipping if the order will meet certain requirements. But because of shipping weight, size and certain restriction it might not be the best solution to purchase extremely heavy or oversized products online and pay extras for delivery. Many retailers, who physically present in your area, might offer an option to buy online with a free delivery to the store for pick up. Not only local, but online actions might be worth to consider if the budget is low but some home improvement still desirable. Typically there won’t be any warranty on such items and an installer or contractor normally won’t provide a warranty on labor as well. However, it might be a good solution for handy homeowners who will renovate the home by self. Sales on certain products are very typical and even though there are won’t be much of options it might be wise to plan remodeling well ahead and look for sales when you can buy some fixtures or materials cheaper than its regular price. Always consider the fact purchasing standard stock items less expensive and on a low budget try to minimize customization. Discontinued products, odd lots, returns, bulk purchases as well as buying reclaimed materials might lead to 30% – 40% savings. It is definitely not an option to consider while planning on creating a stylish design and a complete high end custom home remodeling project, but for those who want to perform some refreshment and budget renovation of existing house it might be a great solution. Depending on what you are buying always take into account possible delivery fees. Many fixtures and smaller items bought online might be shipped for free, but some, very often heavy or big dimensions products might be delivered to your home address at extra charge. 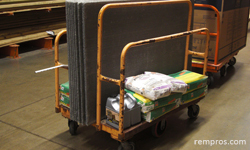 Building materials normally not an online purchase and you should have a proper vehicle to transport it to the job site from a local retailor. It is very typical that a contractor will take care of all building supplies and will provide estimate with labor cost and materials expenses included. Material, fixtures and all additional products are significant expenses while remodeling a home and while savings are always good buying cheapest regardless its quality might turn the whole house renovation project into a big frustration shortly after completion of the work. But cheaper doesn’t always mean not long lasting. Some quality products can be purchase at discounted prices if shopped wisely.